When in Shanghai you absolutely must have dim sum and try all the different kinds of dumplings if you want to truly experience the local cuisine. Unless you don’t like dumplings, but who doesn’t like dumplings – I would be suspicious of someone who doesn’t like dumplings. Or, maybe you have to adhere to a gluten free diet, then I’m sorry. You can probably find gluten free dumplings in Shanghai but certainly not at street stalls or traditional dim sum places. Hmmm, that gives me something to research the next time I’m here. 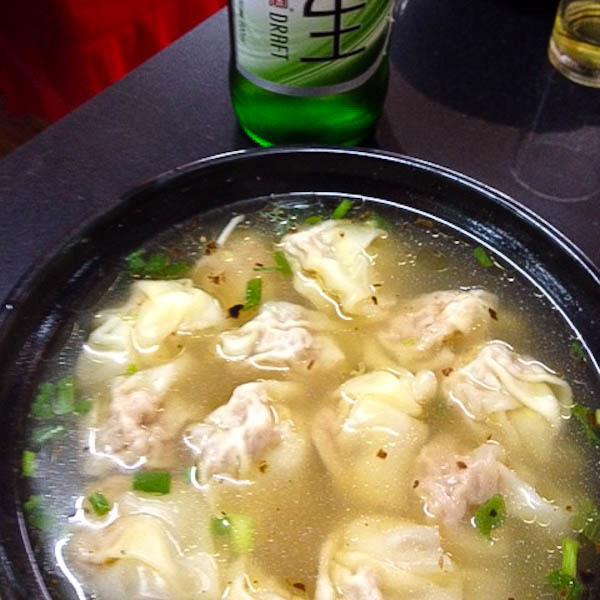 If anyone can lead you to the best places for dumplings or possibly even gluten free dumplings, it would be the folks at UnTour Shanghai. I’ve been on three of their tours and thoroughly enjoyed and learned from each experience. UnTour Shanghai’s guides are either locals or expats who speak Mandarin and have lived in Shanghai long enough to immerse themselves in the culture and cuisine. They take you off the beaten path and carefully curate the restaurants and street vendors that are included in their tours so you can rest assured that you won’t suffer any ill effects and it will be some of the best authentic food you’ll eat during your visit. 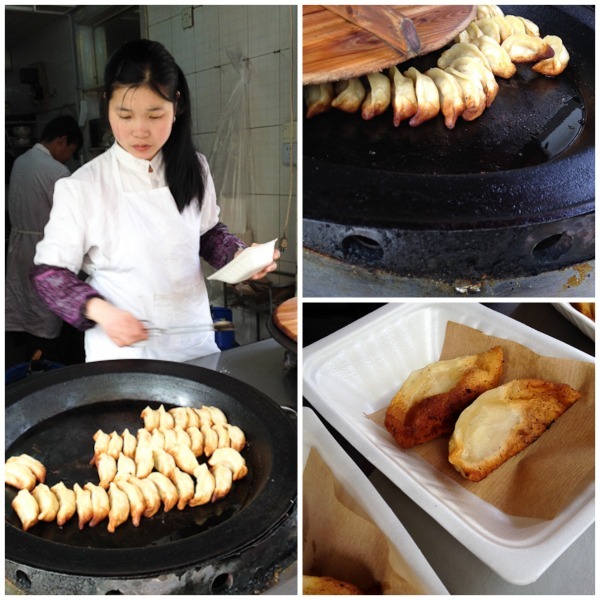 Our first stop was a street hawker stand with a husband and wife team making excellent pork potstickers (guotie 锅贴) in a huge, heavy cast iron street vendor style wok with a seasoned look acquired from decades of cooking. 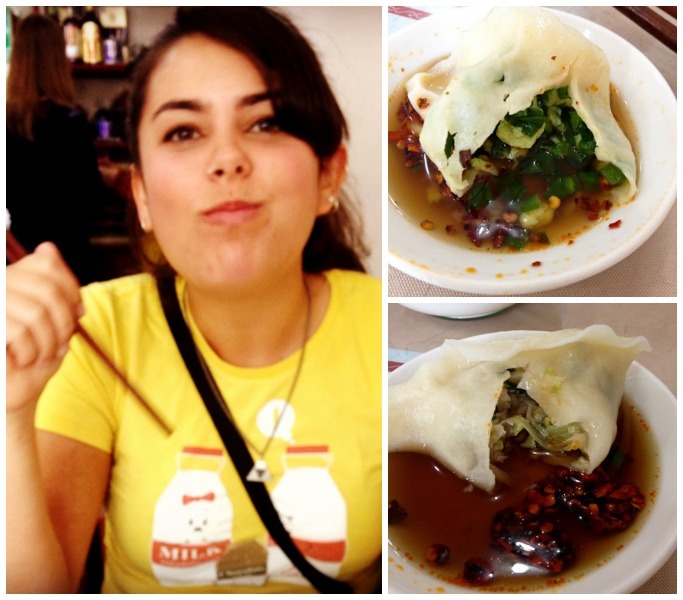 The potstickers were perfect – crispy browned skin enclosing steaming hot tender pork and juices . Our guide Jamie instructed us on the proper way to eat them to avoid burning your mouth. Just down the lane, was another street hawker who rises early to provide the working masses what is best described as a Chinese breakfast crepe/burrito. I don’t have the Chinese name, but it was very good. A large, thin crepe of wheat and millet is brushed with egg, sprinkled with green onions with spicy sauce (if desired), topped with crunchy bits of won ton skins (?) and then folded into a package. A warm, crispy and satisfying breakfast that fuels the body for a long work day. Next up, another family owned food stall called Nanjing Soup Dumplings & Spicy Soup where we ordered several types of soup dumplings (xiaolongbao 小笼包). The little boy ran around excitedly, determined to help set up for our group, and dad gruffly instructed him. We feasted on the perfectly pleated tender-skinned crab, shrimp and pork dumplings and took a brief tour of their small operation. After a short walk to let the trio of soup dumplings settle, we arrived at Harbin Dumpling House 哈尔滨刘记饺子馆 where we ordered the boiled dumplings (shuijiao 水饺) with cabbage (baicai 白菜) and celery (jincai 近菜) and really enjoyed having a vegetable filled dumpling. Customers order large quantities and take some home for later. Many Chinese don’t cook elaborately at home because they have tiny kitchens that may lack the appliances that we are accustomed to. The Bamboo tofu salad (leng fuzhu 冷腐竹) of dried beancurd sticks, also known as dried tofu skin, yuba, fu zhu, or bamboo tofu, was something I’d never experienced. Made from the skin that forms on the surface of boiled soy milk, it has a chewy, almost meaty texture and is used in braises, stir fries, soups, and salads. Like tofu, beancurd sticks have a mild flavor and take on the flavors they are cooked with. 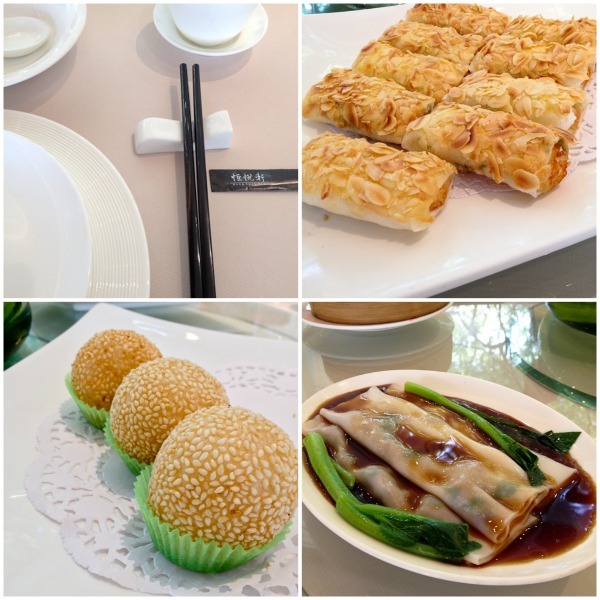 From there we meandered through the former French Concession to a more gentile sit-down dim sum repast at Heng Yue Xuan Dim Sum Mansion 恒悦轩精致香港粤菜 inside Xujiahui Park, bursting with lush spring greenery and fragrant flowering trees, the setting was peacefully tranquil and a welcome respite from the cacophony of bustling street traffic. We were able to catch our collective breath and take a much needed bathroom break. Jamie ordered for us (her mastery of Mandarin is admirable) and we chatted with each other while contemplating the gorgeous scenery and the quiet, elegant dining room. Order: 西杏仁虾卷 (almond shrimp roll xi xingren xiazhuan), 肠粉 (chengfen rice paper rolls), 叉烧酥 (chashao su BBQ pork pastries), and 虾饺王 (xiajiao huang steamed shrimp dumplings). Refreshed and pleasantly stuffed, we had one more stop (can you believe it!) before calling it a delicious dumpling day. The last eatery specialized in what is called 1000 mile fragrant small wontons and they are just that. I can’t say much for the ambiance of the restaurant (nil), but the dumplings were delicate and abundant in a mild broth which gave them their due. And, they had reasonably cold beer. So there you are, you can try to find these places on your own, but I highly recommend you let UnTour Shanghai lead the way, your experience will be so much more enjoyable! I really liked the last small soup wontons and hope to try them again on a chilly day when I’m not already full of dumplings! just came across this looking for some cooking classes…so the burrito is called a jian bing, the crispy bit in the middle is deep fried dough…like a you tiao but different shape. They are delicious. You should also try another shanghai speciality which is a you tiao stuffed with pickled vegetables (and pork floss) and then the whole thing wrapped in sticky rice. its called something like xuecairousongcifantuan which is a bit of a mouthful…in both senses. and what about baozi…theres a chain called babimantou that does extraordinary ones filled with meigancai a dried vegetable thats cooked with bits of tofu. to die for. Hi Priscilla! Was Googling up for some nice places to eat in Shanghai & came across your blog; such a lifesaver! Do you remember the name of the street of the first dumpling stall (husband & wife team)? They look so good, would love to try them! Thank you. Hi Michelle – thanks for stopping by! Let me dig around and see if I still have that itinerary… Happy New Year! Found your blog and thought I’d provide some additional info. Those crepe things are called jianbing (煎饼) and celery is not “jincai” but qincai (芹菜). Next time you should also try the Shanghai classic shengjianbao (生煎包), which are little yeasted buns that are pan-fried then steamed, so they’re like a cross between xiaolongbao and guotie. Delectable! Thanks for the info! I’ll be in Shanghai again in a couple of months and will definitely seek out shengjianbao.